With a focus on lifelong learning, this book examines the shifts that UNESCO’s educational concepts have undergone in reaction to historical pressures and dilemmas since the founding of the organization in 1945. The tensions between UNESCO’s humanistic worldview and the pressures placed on the organization have forced UNESCO to depart from its utopian vision of lifelong learning, while still claiming continuity. 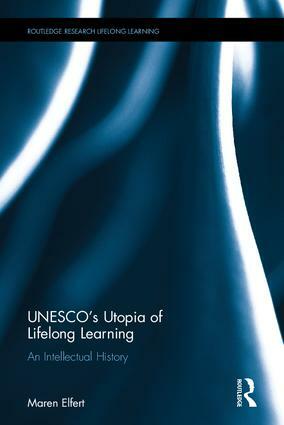 Elfert interprets the history of lifelong learning in UNESCO as part of a much bigger story of a struggle of ideologies between a humanistic-emancipatory and an economistic-technocratic worldview. With a close study of UNESCO’s two education flagship reports, the Faure and Delors reports, Elfert sheds light on the global impact of UNESCO’s professed humanistic goals and its shifting influence on lifelong learning around the world. Maren Elfert is a postdoctoral fellow at the Centre for Global Citizenship Education and Research in the Department of Educational Policy Studies at the University of Alberta, Canada. This series presents the works of established and emerging scholars on the latest research and practices in the field of Lifelong Learning and Adult Education.